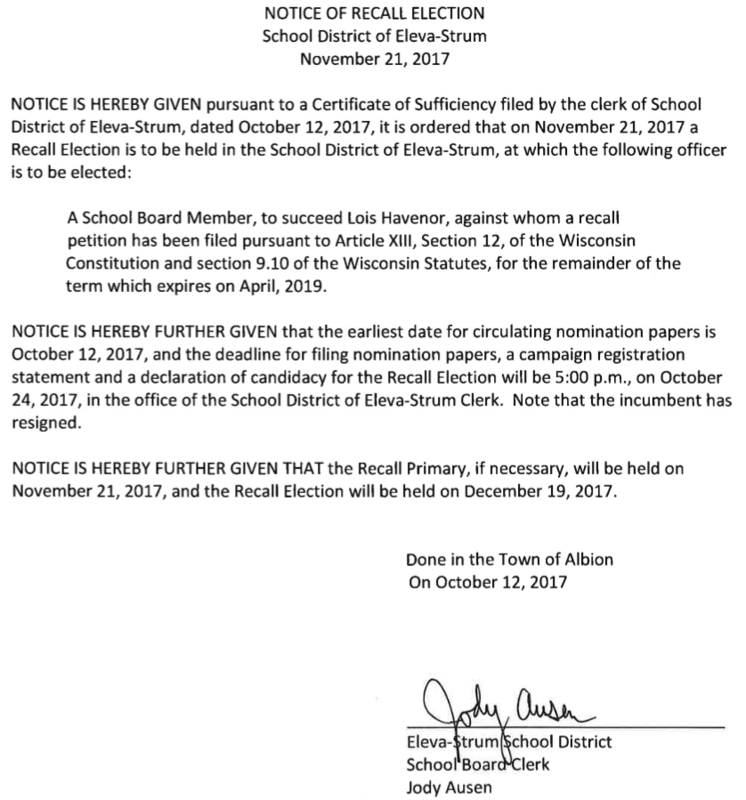 A School Board Member, to succeed Lois Havenor, against whom a recall petition has been filed pursuant to Article XIII, Section 12, of the Wisconsin Constitution and section 9.10 of the Wisconsin Statutes, for the remainder of the term which expires on April, 2019. NOTICE IS HEREBY FURTHER GIVEN that the earliest date for circulating nomination papers is October 12, 2017, and the deadline for filing nomination papers, a campaign registration statement and a declaration of candidacy for the Recall Election will be 5:00 p.m., on October 24, 2017, in the office of the School District of Eleva-Strum Clerk. Note that the incumbent has resigned. NOTICE IS HEREBY FURTHER GIVEN THAT the Recall Primary, if necessary, will be held on November 21, 2017, and the Recall Election will be held on December 19, 2017.